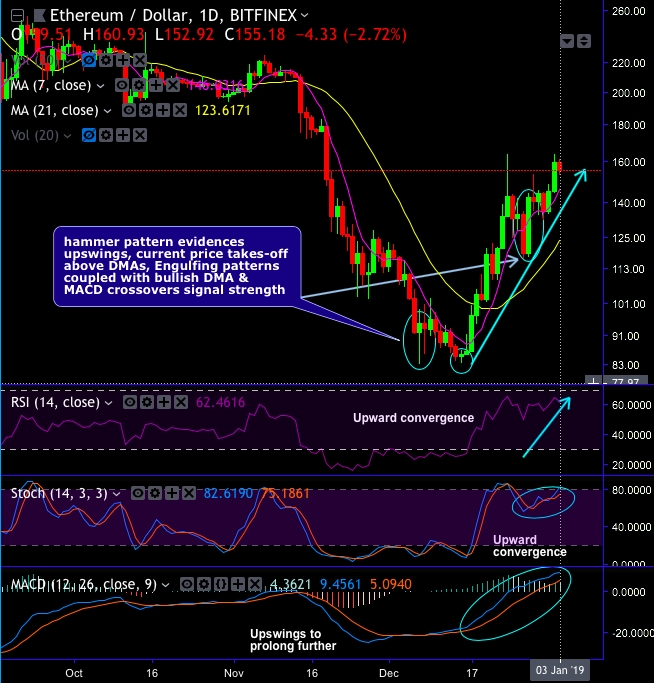 ETHUSD forms hammer pattern candle at $94.79 and $85.74 levels that have evidenced the upswings, consequently, the current price takes-off above DMAs. Recently, the bullish engulfing pattern candle has occurred at $142.15 level, the bullish pattern candle is coupled with bullish DMA & MACD crossovers to signal strength in the prevailing uptrend (refer daily plotting). Well, while articulating, Ethereum (ETH) is trading at $154.62 level with a market cap of $16.1 billion. ETH price advanced considerably and surpassed the $100 mark convincingly to continue the bull run. While the trading volume of this crypto-asset is observed to be on the renowned exchanges, such as, OEX, OKEx and Binance. It would be unwise for those to aggressively criticize this cryptocurrency that is already grooming for the upcoming fork. Technically, the pair has formed bullish engulfing candle at $133.76 levels, ever since then the price keeps rising and for now, it remains well above 7EMAs, while both leading indicators (RSI and stochastic curves) signal the strength in the prevailing bullish swings (refer weekly chart). Thus, we demonstrate further bullish run for Ethereum in both the timeframes. All the indicators are clearly depicting a bright side for the cryptocurrency as it has moved back to the 2ndposition. And to advocate beware of buying now, we would rather recommend long hedges via ETHUSD futures of near-month tenors with a view of arresting further upside risks. Currency Strength Index: FxWirePro's hourly BTC spot index is inching towards 128 levels (which is bullish), while hourly USD spot index was at 37 (mildly bullish) while articulating (at 11:25 GMT).